Call Today for an Appointment (708) 848-0528. We accept Medicaid, numerous insurance plans (listed below) and offer a sliding fee scale. *Any Insurance with an Asterisk signifies that insurance does not cover general anesthesia surgery at Illinois Masonic. We accept All Kids Medicaid and offer a sliding fee scale. Patients must meet the Clinic’s income eligibility guidelines. Does your child need to see a physician today? Your appointment is just a phone call away. 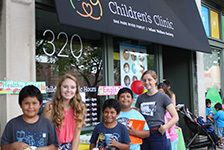 Same Day Scheduling is available at IWS Children’s Clinic during regular clinic hours by calling (708) 848-0528. Walk-in hours for medical appointments are available at the IWS Children’s Clinic for existing patients during regular clinic hours. You do not need to call ahead for an appointment. Simply just show up at the IWS Children’s Clinic and your child will be seen as soon as possible. Due to the increased time involved with your first visit to the office we cannot accommodate walk-ins for patients who have not previously been seen in our office. All Kids is Illinois' program for children who need comprehensive, affordable health insurance, regardless of immigration status or health condition. Contact the IWS Children’s Clinic to schedule an appointment or to ask about All Kids enrollment, health plan enrollment, our sliding scale, and other concerns.